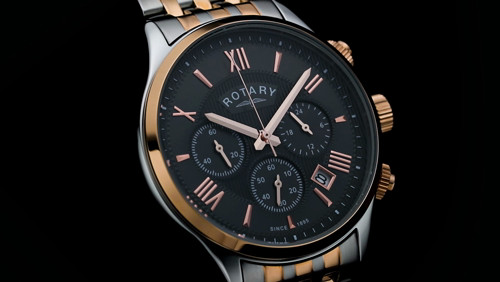 This exclusive Rotary men's two-tone chronograph watch features a classic black dial with rose gold roman numeral hour markers, timing function sub dials and a date window at 5 o'clock. This men's timepiece oozes class and sophistication, perfect to be worn every day or to be kept for those special occasions. 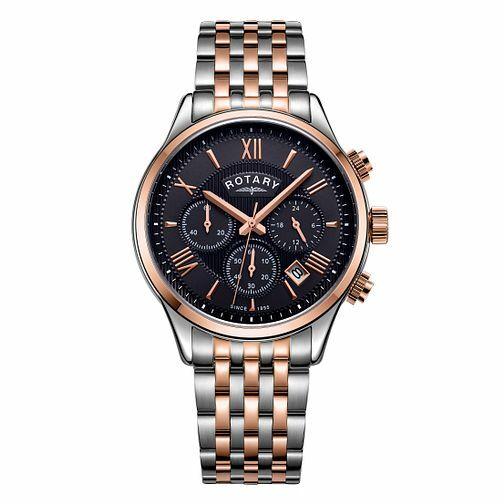 Rotary Men's Two Tone Steel Bracelet Chronograph Watch is rated 5.0 out of 5 by 4. Rated 5 out of 5 by Anonymous from A wonderful statement watch Bought this as a Christmas present for my boyfriend and he adores it. It looks fantastic and the black face really compliments the colour in the links. Adore it! Rated 5 out of 5 by Anonymous from Amazing product This product is amazing. Would highly recommend H Samuel to any family and gtiends. Fast easy delivery. No problems at all.